Since I was 16, I have moved 20 times. Yes, literally 20 times. Needless to say, I became slightly obsessive about holding onto things. I didn’t have much to begin with, so it felt really important to hold onto everything I could. Everything from the dresser my parents gave me when I was 11 to a hideous photo of a sunflower my father stole from work and presented me with when we were too poor to re-do my bedroom in a sunflower theme. This was a very big deal to me at 11. 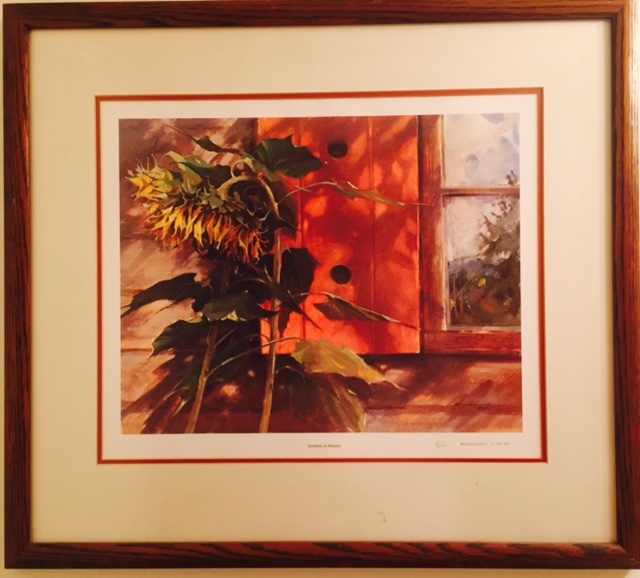 I settled for floral boarder my grandma had laying around and this photo of a dying sun flower that my father proudly hung on my wall like a trophy. It’s in a wood stained frame and the glass has a permanent black scuff I could never get off. The flower stands sadly outside a window wilting in the sunset, its life coming to a tragic and beautiful end. I have been a witness to its death now for 20 years. Currently, it hangs behind my bathroom door and every time I wash my hands, I truly feel for this flower. The reasons as to why an artist would choose a dying flower in a sunset as an expression of themselves and their art is truly beyond me, but yet, I carry it around, on every move. This photo has few fans, actually it has no fans, and everyone seems to want to let me know that they hate this photo. It doesn’t even have a cult following. I’ve had many live-in boyfriends in the past that all threatened to toss it at one point or another and yet, it remains and they do not. I’ve also carried around a tattered and half broken wood dresser to accompany the dying flower. The top is stained from a pink candle I made when I was 12. No one thought it was a bad idea to put real potpourri in something that was meant to burn. So, one night while listening to prince on repeat, far too long and while chatting with boys online while my girlfriends on looked and giggled, I suddenly was aware of the silence. I discovered after entering my bedroom to continue the prince marathon that my incredibly stupid, but arguably genius, homemade potpourri candle had caught on fire and was now currently burning the wall, my dresser and my brand new stereo system. My father swooped in out of nowhere like superman on steroids and picked up the entire fiery mess and promptly ran outside with it where he doused it with the garden hose as I watched in horror fearing the worst, not only for my Prince CD, but also the stereo system. Oh, stop it. My dad was superman on steroids, remember? I don’t need to worry about him. Anyway, I am not totally sure why he thought this method was the best idea, but it seemed to do the job. In case you’re wondering, the stereo still worked for years after that, even though the top part that played records had been sealed shut by melted plastic. I always told myself one day I’d sand that dresser and it would be good as new, that was 20 years ago. Why do I insist on carrying this around with me? I’m getting ready to make yet another move and I’m looking at all of these things I keep holding onto and taking some serious notes on the emotional stake I have in them. It’s interesting, I never considered myself a particularly materialistic person. If fact, I always imagined I’d be most happy with nothing but a few changes of clothes and a back pack traveling around the world. So, why do I continue to hold onto these “things”? It occurred to me as I stared at the pink waxy stain that I wasn’t holding onto these things, I was holding onto what they represented. I was holding onto those moments when my now deceased father was my hero and it felt almost like a betrayal to be rid of them. It was also emotionally charged with the memories of when he was my nightmare and since that was also part of who” I am”, it felt like I would be giving up my childhood identity by giving up these things. I know now, by having these things around all the time, to touch, to see, to experience, I was never really leaving those emotions behind. Do I need to continue to identify with this time in my life? I think it’s time to give them up. It’s time to clean house. It’s time to be OK with letting go of it all, the things, the emotions, the past. So, with this move, I say goodbye to the baggage, the dying sunflower and the pink stain. What baggage do you need to say goodbye to?